When I wrote my column for today’s Washington Post Food section on books to buy the oenophiliac on your list, I left out the most imposing one. Primarily because of space, but also because I couldn’t bring myself to recommend a book with a list price of $175, even though it actually sells for about $110. This is a book wine lovers will buy for themselves, without asking permission from the spouse or the bank. And they will be proud to own it. 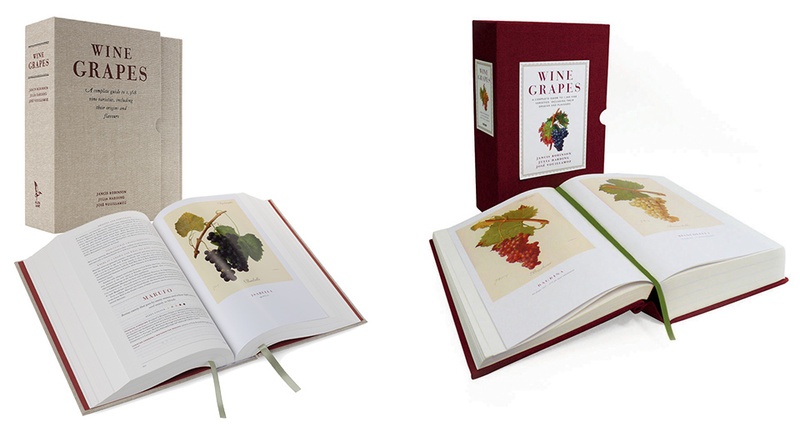 The book of course is Wine Grapes, by Jancis Robinson, Julia Harding, and José Vouillamoz. Readers of this blog will know, especially if you’ve been reading since before it was a blog, of my admiration for Robinson. I’ve never hidden this admiration, and my wife is okay with it. Jancis writes about wine with authority but without a trace of pretension – in fact, often humor – and with a grace that makes it look easy despite all the effort that obviously goes into her work. This is a book of biblical scale that should occupy space on your shelf right next to The Oxford Companion to Wine. Better reinforce that shelf, though – the book weighs more than seven pounds. It comes in a beautiful slipcase, so on second thought maybe it belongs with your Oxford English Dictionary. Which should, come to think of it, be right next to your Oxford Companion to Wine. This book is a must-have for anyone working toward any type of wine certification, or simply obsessed with the grape. And it is great for studying up for your next dinner party encounter with a wine know-it-all. Take tribidrag, for example. Ever hear of it? Neither had I, I’ll confess, until I looked up zinfandel expecting to be redirected to some hard-to-pronounce Croatian variety with more syllables than vowels. Indeed, crljenak kastelanski is another, more modern name for the grape in Croatia, and the last one I had heard before I must have dozed off. But no worries, the tribidrag entry in Wine Grapes includes an account of the decades of genetic research into zinfandel’s identity, from its identification with primitivo in southern Italy to the original (mistaken) Croatian link to plavac mali. This entry was posted in Books, Wine, writers and tagged Books, Grapes, Jancis Robinson, Master of Wine, Wine, Wine Grapes. Bookmark the permalink. How many terrabytes do you have on it? The tome sits at the top of my list to Santa, but I’m not hopeful to find it under the tree in a couple of weeks. Oh well. Torn between then splurging on it or waiting (in vain?) for the paperback and or e-book version. I may need to visit Barnes & Nobles just to get the answer to my immediate question that you provide some evidence for, Dave – do the authors treat grape types traditionally, as proper nouns, or go with the current trend without capitals? They are “varietals” – named for the variety of grape that predominates in the wine. s younger crowd mixes pisco with Coca Cola, forming piscola. Consumptions patterns is influenced and affected by the accessibility of the products.